The HP 3468A multimeter repaired in the last post uses something called “closed-case” or software calibration. 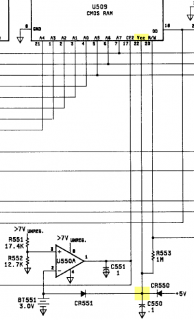 Instead of making physical adjustments to controls inside, calibration involves applying known reference levels and having the meter store calibration constants. These are essentially offset values that will allow the meter to show a correct value even though internally there are small errors due to normal component tolerances. It is obviously important to store this data permanently. This model (and it’s cousin the 3478A) use a 3.0V long-life lithium cell to maintain the power supply for a static RAM device (U509) when the power is off. Shelf life is generally considered to be 10 to 15 years for this type of cell, although they can last much longer. The problem is that the discharge curve for this type of battery is very flat right up to the point at which it is almost completely discharged. Just the fact that it reads 3.0V or better does not mean that it has plenty of life left. If it’s old or its age is unknown, it’s probably best to replace this battery to avoid an expensive calibration/adjustment procedure from a professional metrology service. The procedure described here involves working on a mains-powered instrument with the power on. If you choose to duplicate these steps, then please exercise due caution. The replacement chosen is a Panasonic BR-2/3A with PCB pins (Digi-Key P/N P226-ND). It is physically the same size as the original and should drop right in. In order to replace the cell without disrupting the power supply to the SRAM, the battery will be replaced with the power on. To avoid having a grounded-tip soldering iron cause problems, a butane gas-powered soldering iron will be used. And just in case of a mains power interruption, I will also add a 3V primary battery pack for insurance. The 3V battery pack (2 fresh 1.5V cells) will be connected via a diode (to prevent back-feeding the battery) and will be soldered in for security. The diode used here is a 1N5817 Schottky from my junk drawer. Just about any small diode will do though. I put heat-shrink over it to avoid accidental shorts. The ribbon cable connector for the LCD display is in the way, so it has to be disconnected and moved. It fits into the plated-through holes on the LCD board, and can be gently pried off. The SRAM that must remain powered (U509) is in the corner. It is a 22-pin NEC μPD5101L 1024-bit (256×4) RAM. Pin 22 is Vcc. Minimum supply voltage for data retention is 2.0V. Standby current is 10μA. The 3.0V lithium battery and the on-board +5V supply rail is diode-ORed to supply Vcc for the SRAM. The +5V rail goes through CR550, and the battery goes through CR551. The junction of the cathodes is Vcc for the SRAM. This is where the diode-buffered external battery pack will be attached. The points of interest for this operation are just above the battery. 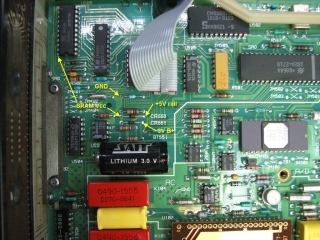 The junction of the cathodes of CR550 and CR551 leads to the Vcc pin of the SRAM. Care should be taken not to short this node to anything else during the procedure. With the power ON, the old battery leads are snipped off. This makes it very easy to remove the stubs from the PCB and clear the holes of solder, all while working from the top side of the PCB. Watch for solder splashes and be very careful about shorting adjacent leads with the soldering iron. The new battery fits the PCB holes perfectly and is soldered in from the top side. The holes are fairly large and require quite a bit of solder to fill up. The battery terminal pins also serve as the only physical mounting for the battery, so the connections need to be very secure. The power is still ON at this point. The external battery pack has been removed. Reconnecting the LCD ribbon cable results in garbage on the display, but it doesn’t seem to hurt anything. It’s not a bad idea to verify voltage measurements before turning the power off and trusting the new battery. 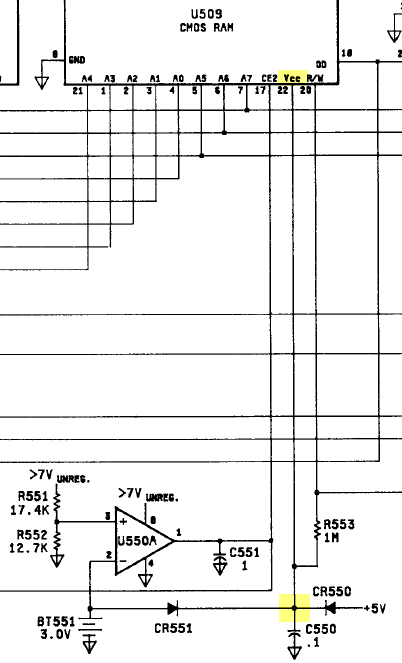 Here, the SRAM Vcc node is a diode-drop below the +5V rail at 4.40V. CR551 is therefore reverse-biased, so the battery is not being used at this point. The new battery voltage is 3.39V. The battery voltage also appears at the anode of CR551, so the new battery must be connected OK. It should be safe to rely on the new battery. The mains power is turned OFF. Checking the SRAM Vcc at the diode junction shows 3.19V. The battery is now supplying Vcc. The stand-by current is so low that the forward voltage across CR551 is much lower than the usual 0.6V. Upon turning the power back ON, the self-test passes. There is no indication of “Error 1”, which would indicate the loss of calibration RAM data. A quick check with a 5.000V reference shows that the meter is still calibrated and operating correctly. This entry was posted in How-To, Repair and tagged DMM, HP/Agilent. Bookmark the permalink. Well done mate, its good for another million years now ha ha. Im a lover of old style systems, eeproms now are register programmed and i had to buy a willem programmer to use them 🙁 dam progress..
It’s beyond my means to dump the RAM contents, either via GPIB or sniffing. But I’ve seen the idea of trying to obtain and save the RAM contents mentioned by others. It looks like either no one has been successful, or else no one has documented it. There are a lot of owners of old equipment with battery-backed RAM that would surely be interested! Thinking quick, backing up and restoring bog standard sram shouldn’t be hard. If you can hold the processor in reset, you should be able to attach something else on the bus and just read/write memory easily. No need to trick or sniff the firmware and no need to go fast. You have to check the address decoding etc, but there shouldn’t be other problems, should there? Looking at older posts again, sorry. if you got a simple type of nv ram (no registers) and wired it so it “never” outputted (input only) and fed its WRite pin with the inverted Hp RD line that feeds the battery backed up ram, it should record every location/content the hp reads from its ram. Address and data lines paralleled of cause, and the chip enable line from the battery backed up ram also would be used to select the external nv ram at the right time. You might use buffers to ensure that the data only goes to the external nv ram. I have an HP 3468A with option 001 (battery power option). When I change the 3V lithium battery, do I still need to solder another 3V battery to prevent the loss of the content of the ram memory? Well, after meticulously studying your procedure and emulating it TO THE LETTER, I performed the surgery on my 3468A and found the operation to be a success..
..except the patient died! (I got the infamous ERROR 1 on boot-up.) So, sadly, Zod does not possess the skill, cunning, and derring-do as Mr Modem Head. But then again, I found a great cal shop who will put a band-aid on the unit’s “owie”, kiss it, and send it out to play with the other little DMMs on my bench good as new (for only $65) so I am a happy camper. But, I would hasten to add that I share your readers’ disrespect of mjlorman so far to agree that the guy is a lisping wanker. In fact, some reserved enmity for him also spreads to Dave Jones over at EEVBLOG. Basically, their videos on calibrating a 3478A are nothing more than 45-minute brag videos either about how they scored fantastic voltage standard machines at swaps for a song or tedious droning on and on (and on and on) about the temperature in their workshops. Tangentially, I scribbled down a few notes on my blog about this adventure and will feature your fine site as an example of an outstanding resource, artfully done and chocked full o’ info. I’m really sorry you ended up with a problem, but it is good that you can get a fresh calibration for a reasonable charge. I also wish we knew exactly what went wrong! I hate to think my procedure could have caused a problem. I thought the process was reasonably fool-proof, and I certainly do not possess any ninja skills. You earn nothing but praise from me regarding your blog and your incredible efforts herein. If anything, you have performed an intervention for me and I am now refocused on melting rolls of solder than scouring swap meets and the annals of eBay. After all, three Simpson 260s, a Triplett 630 NA, DMMs, three scopes (including a 7704A and more plug-ins than Carter has little liver pills)? Yeah, shamed to say I got G.A.S. The procedure worked well; thanks. The only trivial differences was that I used 3 NiMH batteries (3.75V) instead of 2 alkalines, and it wasn’t connected to the mains because I used a mains iron with a grounded tip. Ok, so it is possible to change the battery while is not connected to the mains and using only two AA. So the mains is just another safety measure. I assume. I followed the instructions and it worked perfectly. However, when I was taking off the lcd ribbon cable the connector fell apart. Thankfully I was able to cut it off and solder the wires back on to the display. Make sure to be careful when taking the connector off! No need to connect an external battery. Use the B2 command to read the 255-nibble calibration constants, change the battery, then use the B3 command to write the constants back. Also, no need to power the instrument while changing the battery. Many thanks to ModemHead for pathfinding this procedure, it helped me greatly in my own planning. I bought my 3468A HP-IL recently from a great eBay seller in the UK and the internal backup battery was still reading 3.024V after 30+ years. Eternacell is right! Seeing that the backup battery BT551 is connected directly to the comparator U550A, which is the power-on reset, I chose to perform the procedure with the multimeter turned off and rely solely on my external battery. I didn’t want the comparator to be changing state noisily and have the input pin floating while the internal battery was changed. The comparator output goes directly to the RAM chip U509 that we trying to mollycoddle. As I was going to completely rely on my external battery to support the RAM, I didn’t want battery holder contacts causing any momentary disconnections, which they often do. For this reason I chose a Li-Ion cell (3.7V) that I had recovered from an old laptop which I know holds its charge reliably for months and which I topped off, just to be sure. I soldered a rectifier and a 1K resistor in series to the +ve terminal to prevent any unpleasantness in case the wires shorted to themselves or anything else. Being in maximum paranoia mode, I connected two slim wires in parallel from each of the external battery terminals to where they were soldered to the board. I have had stranded wires that were internally fractured and disconnected if bent in a particular way and this seemed like an easy solution to eliminate that possibility. I folded a cardboard shield around the display cable instead of disconnecting it and access was still good enough. I cut a paper shield to protect the board while I was soldering. In the UK, I was not able to source the 2-pin version of the Panasonic battery from a reliable source and so I had to buy the 3-pin version from Cell Pack Solutions, who were terrific. This version will not solder directly to the board as the offset makes the battery foul the components either side. My solution was to fashion a pair of S-shaped contacts from solid copper wire and solder them to the battery first. The extra length means that when I soldered the battery to the board, the previously soldered joints would not remelt. They also allow the battery to maintain a low profile under the metal shield. I (obsessively) measured voltages at every stage and it turned out OK. The new battery read 3.367V and hopefully it will last for a similarly long time. I also used a gas iron while keeping the multimeter earthed (but switched off at the mains). It’s worth noting that this instrument puts its power switch on the secondary side of the transformer, so even when switched off at the front panel, it’s still drawing power. I can see that this might be good for thermal stability but I would usually turn the meter off at the mains instead of having the transformer running 24/7. Thanks again to ModemHead and to those who have commented here. Just performed this operation on my new-to-me 3468a. Thanks so much for the instructions I don’t know if it would have been successful without them. The new battery was from digi-key with a voltage of 3.3758v and the old battery (never removed as far as I can tell) was 3.4378v. I was’t really expecting that. Date codes on the two batteries were 88-11 on the old one and 7943 on the new one. Most date codes on the chips were 89 so I guess they have changed how they code the dates. Grateful thanks, Mr ModemHead, for your clear instructions which enabled me to successfully replace the battery in my 3468B today. Based on the serial number, my HP is a 1982 model and as far as I can tell, the Eternacell (marked with HP P/N 1420-0278) was the original battery, in which case it has kept going for over 36 years! I was shocked when I measured the battery voltage prior to starting surgery, to get a reading of 2.47v! Not having a butane iron, isolation transformer or inverter I settled for the plug in the soldering iron, unplug when it reached operating temperature, do as much soldering as I could until the temperature got too low and then repeat method – thanks to BitBastelei’s Youtube video of replacing the battery in a 3478A for the idea. It wasn’t as onerous as I had expected – I just had to be careful to always make sure the soldering iron was unplugged before I picked it up to do any work. I also used Joel’s idea (thanks Joel!) of making a cardboard shield to protect the display ribbon cable so that I didn’t need to disconnect it during the work. I used a 3.6v Saft Lithium Thionyl battery – 2100mAh capacity – (RS Components UK P/N 1436-4796) which came in an axial package so I was able to (carefully) bend the wires at either end so they slotted straight into the holes left by the removal of the old battery. After replacement and with mains power off, the new battery gave readings of 3.65v and 3.45v either side of the CR551 diode. I was mightily relieved to get “self test ok” on switching it back on!